The LilyTiny (and LilyTwinkle) are both great, low-cost, sew-able microcontrollers for eTextile projects. 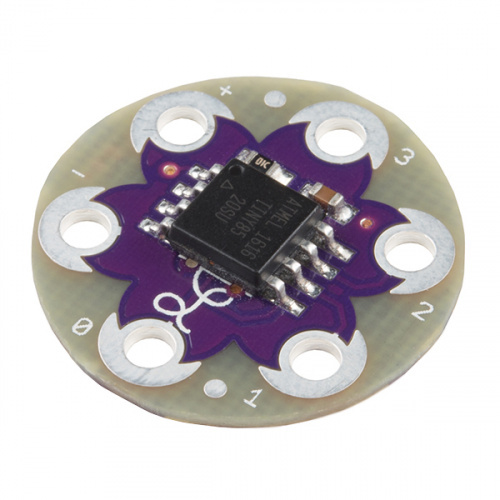 For most projects that only need to interface to a small number of LEDs or sensors, the LilyTiny is a great option. Note:You can also use this tutorial to reprogram the ATtiny85 on the LilyTwinkle and LilyTwinkle ProtoSnap. The only difference is how the microcontroller is programmed. Each of the four pins are programmed to randomly fade. This is a great place to start, but the only way to re-program one of these boards is to use an AVR Programmer and an ISP Pogo Pin Adapter to connect to the 6 exposed pins on the bottom of the LilyTiny board. This is okay if you haven't already sewn your board into your project. If you have, we can still re-program your board. This tutorial will show you exactly how to accomplish this. 1x LilyTiny (or LilyTwinkle) to reprogram. 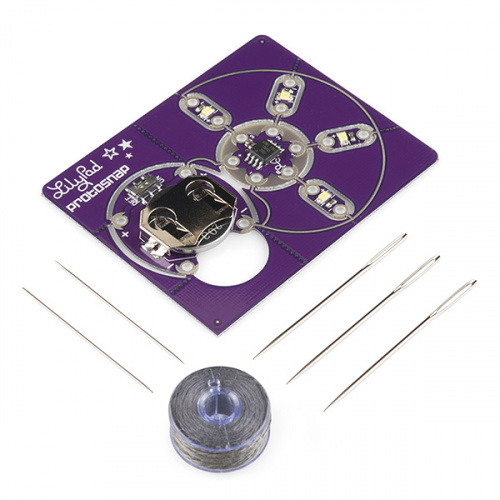 The Protosnap LIlyTwinkle Kit is a great option for beginners! There are a couple of ways to re-program your board. We will focus on one of the easiest methods here -- using the Tiny AVR Programming stick. Tiny AVR Programming Stick with Pomona 5250 SOIC Clip used to re-rogram the ATtiny85 on the LilyTwinkle. Before we start, we need to setup the Arduino programming environment to handle the ATTiny hardware. The ATTiny is not part of the "default" board files that comes with Arduino IDE v1.x. You will need to "install" these board files to your Arduino environment in order to re-program your LilyTiny.  Tip: For beginners, you can automatically install using the Arduino boards manager by following the directions in "Installing the ATtiny Support in Arduino v1.6.4+." The instructions also include information about manually installing the files for older versions of Arduino like the directions provided in this tutorial. If you prefer to manually install the files, we will first need to install the ATtiny hardware board files. Download the zipped files from the GitHub repository to manually install the files. 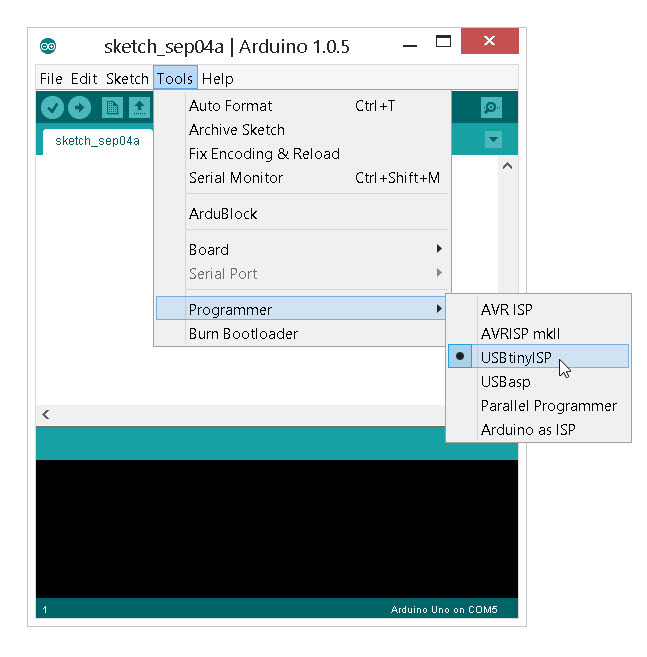 Create a folder under your Arduino sketchbook called "hardware." Create a new sub-folder called “hardware” in the sketchbook folder, if it doesn’t exist already. Open (unzip) the attiny-master.zip file and copy the “attiny” folder (not the attiny-master folder) from the unzipped attiny-master.zip file to your new “hardware” folder. You should end up with folder structure like Documents > Arduino > hardware > attiny that contains the boards.txt file and another folder called variants.h. You should see ATtiny entries in the Tools > Board menu. Follow the hook-up guide for the Tiny AVR programmer. For Windows / PC users, there are a few driver files that you'll need. For Mac / OS X users, the Tiny AVR Programmer should be plug-and-play ready. A how-to on the Tiny AVR Programmer. How to install drivers, hook it up, and program your favorite Tiny AVRs using AVRDUDE! While the photos show us using the 4-wire ribbon cables and the straight pin break-away headers to connect the SOIC clip to the Tiny AVR Programmer, we have found that the straight pin break-away headers (or any square pins) do not sit into the Tiny AVR Programmer very well. Instead, we recommend using the 12" Male-to-Female jumper wires to connect the SOIC clip to the Tiny AVR Programmer. 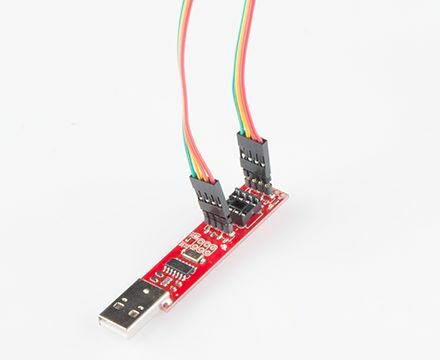 Make sure that the left side pins on the programmer are wired to the left side of the clip and the right side pins are wired to the right side of the clip. When you clip this onto the LilyTiny, make sure that the chip is right-side up. There are a few distinguishing marks to identify which way is up. On the programmer, there is a notch where an 8-pin chip would go. This should be up. And, on the LilyTiny, the Lilypad script "L" should be on the bottom. When you are finished connecting the Tiny AVR Programmer to the ATtiny85, it should look similar to the image below. You are now ready to re-program the LilyTiny or LilyTwinkle! The last step is to insert the Tiny AVR Programmer to your computer&apos;s USB port to begin programming. Tip: We recommend using a USB extension cable with the Tiny AVR Programmer so you have a little more movement from your computer when re-programming. Test Code - "Hello World!" Note: This example assumes you are using the latest version of the Arduino IDE on your desktop. If this is your first time using Arduino, please review our tutorial on installing the Arduino IDE. As with nearly every introductory Arduino project, we test our system with a "blink" program -- the equivalent to "Hello World!" in most other programming environments. First, we need to make sure the configuration is set properly in the Arduino IDE. 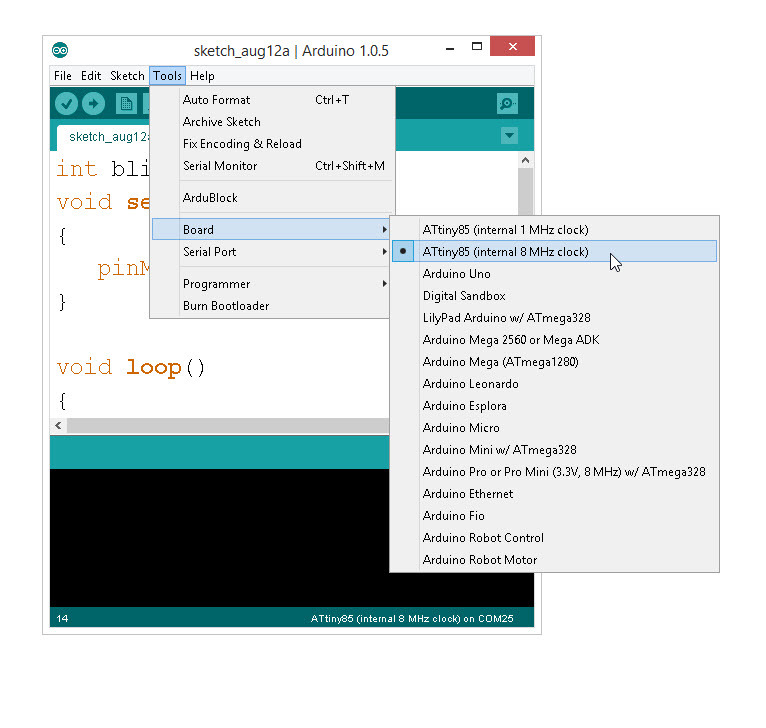 Open the Arduino IDE if you have not already. Because we are using the Tiny AVR as our programmer, we need the change the default programmer. This settings is also under the Tools > Programmer > USBtinyISP. Copy the code below and paste this into your Arduino window. You can ignore this one. If everything is working, you should be able to see a blinking LED on GPIO 0 (pin 5 of the ATtiny). This can be on the Tiny AVR Programmer, the ProtoSnap LilyTwinkle Kit, or an LED that is attached to the ATtiny 85. The ATtiny85 isn’t your everyday Arduino microcontroller. It packs a lot of punch for its small size. All 5 pins are general purpose digital I/Os (GPIO). This means that they can be used with both digitalWrite() and digitalRead(). Pins 0 and 1 support PWM output (analogWrite). Pins 2, 3, & 4 are tied to A/D on the chip (analogRead). While the ATtiny85 supports most of the things you need, there are some things it can’t do. 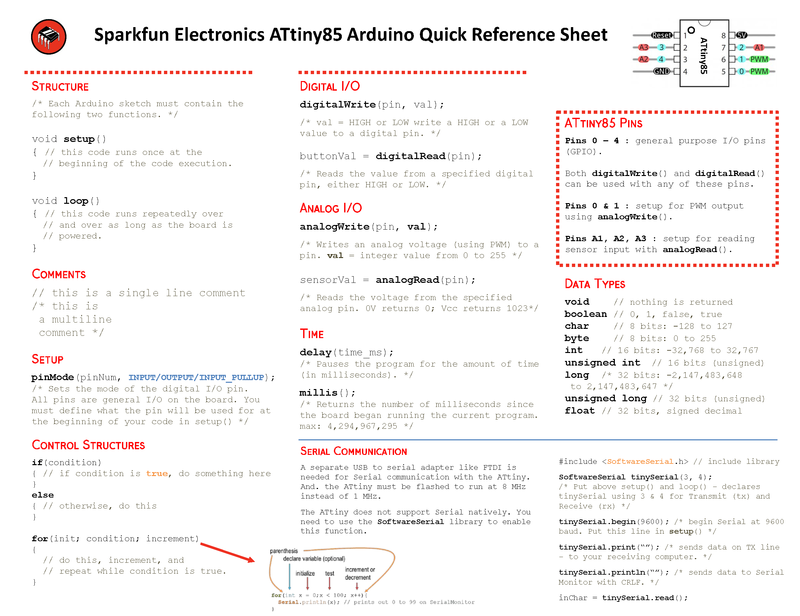 Tip: Looking for a quick reference guide for the ATtiny85? Click on the link below to download an image or PDF version from our resources! The TinyAVR Programmer is a real slick way to re-program the ATTiny45 or ATTiny85 chips. However, it does require that you install a few additional drivers. You can use this programmer directly with the Pomona 5250 SOIC clip. This programmer already has a debug LED on pin 0. We have a full hook-up guide for the Tiny AVR Programmer here. High-Low Tech Tutorial -- An overview of programming the ATtiny85 using an Arduino Uno as a programmer. ATtiny85 Board Definitions -- The attiny folder should live within a hardware folder in your Arduino sketchbook. H2OhNo! -- The H2OhNo! water alarm and development board uses an ATtiny85 to sense the presence of water. This tutorial goes deep into getting the ATtiny85 into a very low power mode. Shift Registers -- If you're feeling restrained by the ATtiny's lack of pins, you may be able to use a shift register to expand on that I/O count. 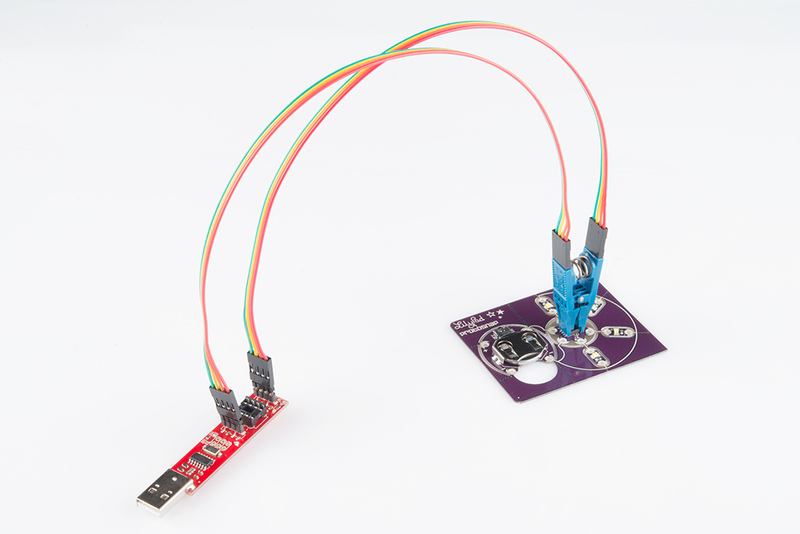 Using the Arduino Pro Mini 3.3V -- If you're looking for small, but need more pins and functionality check out the Arduino Pro Mini. Installing an Arduino Bootloader -- You can use the Tiny AVR Programmer to program all sorts of AVRs, including those on most Arduino-compatible boards. If you ever find yourself needing to reprogram your Arduino bootloader, the Tiny AVR Programmer should be all you need. 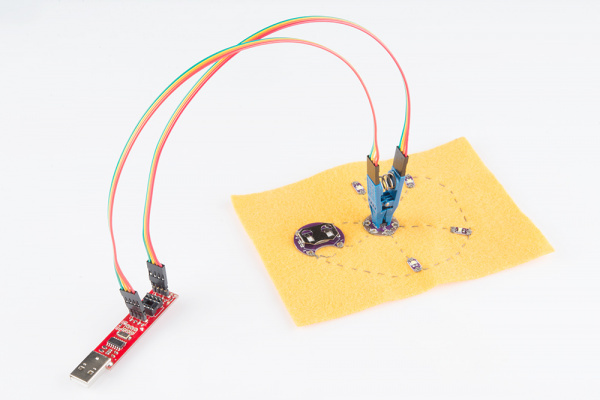 Or check out these tutorials using the Attiny. The Uncertain 7-Cube is a non-committal, less-than-helpful, but also entirely honest fortune teller. Simply ask it a yes or no question, give it a nudge, and the 7-Cube will dutifully inform you that it doesn’t have all the facts and doesn’t feel comfortable making a guess. Make a soft circuit firefly jar with conductive thread, LEDs, and the LilyTwinkle! Make a beautiful night sky costume using the LilyPad LEDs and the LilyTiny. Get started switching those higher power loads around with the Qwiic Single Relay.